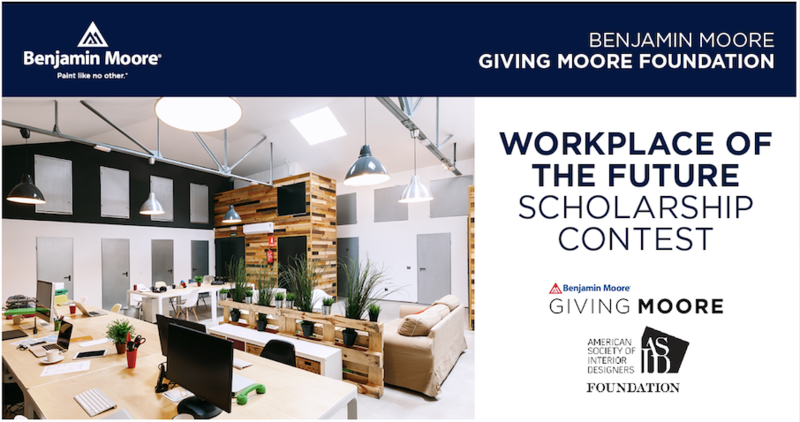 Interior design students with ideas about how offices of the future might look are invited to participate in a new scholarship contest organized by Benjamin Moore and the American Society of Interior Designers (ASID). Announced Friday (April 1), the contest aims to provide students an opportunity to demonstrate interest and ability in utilizing forward-thinking designs and materials, organizers say. Entries will be accepted until May 15. Winners will be announced in June. Three winners will receive a $5,000 scholarship towards an accredited U.S. college or university. The entries will be judged on presentation (20 percent), conceptual creativity (30 percent), and design competency (50 percent). Official contest rules are here.